A variation known as donair was introduced in Halifax, Nova Scotia, in the early 1970s. 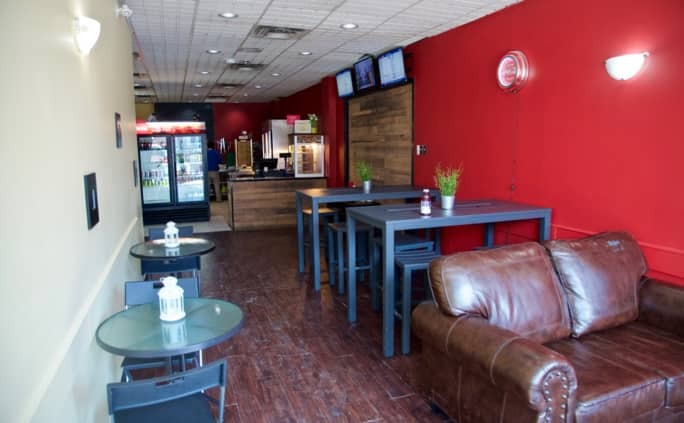 There are competing claims about the origin, but according to Halifax resident Leo Gamoulakos, his father, Greek immigrant Peter Gamoulakos, started selling Greek-style gyros at Velos Pizza in the Halifax suburb of Bedford. It did not catch on with the public, so in 1972 he modified the customary pork and lamb recipe by using spiced ground beef, Lebanese flatbread, and inventing the distinctive sweet donair sauce made with condensed milk, vinegar, sugar, and garlic. He called it by the doner name rather than gyros, but it came to be pronounced, and spelled, as donair. Historically found only in Atlantic Canada, the dishes popularity has expanded throughout Canada. Since shawarmas and gyros did “catch on with the public” in Toronto, I guess that’s why donairs haven’t become as popular here? Michelle and I had our dogs with us, so we got a small donair to go and ate it on the subway on the way home. Boy did that ever hit the spot! When I got home I thought to look the place up and that’s when I found out it’s actually a Nova-Scotia-based pizza chain, and this is their only location outside of The Maritimes. Of course, I had to go back. In Nova Scotia, they’re known as “Jessy’s Pizza,” but the owner told me that at this Toronto location, they sell more than twenty donairs for every pizza they sell, so they changed their sign to emphasize the donairs more. Good call. They have a lot of customers from The Maritimes and Western Canada that drive large distances across the GTA for their donairs. A standard donair from the east coast comes with donair meat, tomato, raw onion and sticky sweet sauce on a pita, and nothing else. I ask them to put lettuce on mine, which they tell me is a common request from those coming from Western Canada. Interesting. The large donair at Jessy’s Pizza is roughly equivalent to the small size I was used to ordering at Jimmy’s A&A in Calgary. They actually only have one size of pita bread though, so the only thing that changes from size to size is the quantity of meat. I’ve tried the small, medium and large and I think I’ll stick to the medium from now on — it has the ideal ratio of donair meat to pita bread. The donairs at Jessy’s are excellent — the pita is soft and always fresh; the meat is super moist and packed with flavour; and the donair sauce is as sweet as it should be without overpowering the meat. I wish they had shredded iceberg lettuce instead of romaine, but that’s very minor. I’m just glad they’re willing to put lettuce on it at all. My only complaint with the donairs at Jessy’s Pizza is that they wrap them in thick aluminum foil instead of the lighter one-side-foil-one-side-paper that you get everywhere else. It makes it much harder to eat, more uncomfortable and a heck of a lot messier. But if my only complaint is the wrapper and not the food itself, then you know they must be serving up some very tasty donairs! 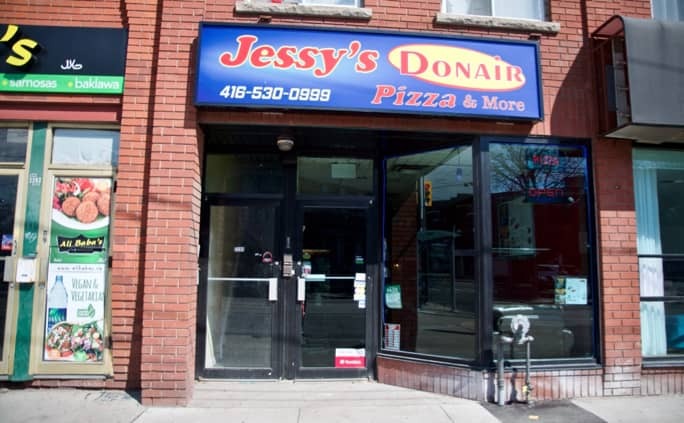 Jessy’s Pizza also serves donair egg rolls, donair pogos, burgers, wings, poutine, wraps, subs, fish & chips, chicken fingers and of course, pizza, but after a decade-long drought without donairs in Toronto, you can understand why it’s all about the donairs for me. Jessy’s Donair was published by Daniel Menjívar on April 5, 2019 at 12:30:10 PM EDT and last updated on April 18, 2019 at 4:41:41 PM UTC .